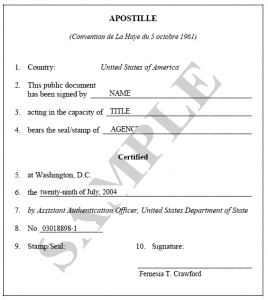 Since both South Korea and the United States are member countries of the Apostille Section of The Hague Convention, they recognize the Apostille as a form of document legalization or authentication.Documents issued by US authorities, or business documents or documents which have been previously notarized in accordance with the procedures of the various states must be “authenticated” in accordance with the Rules and Regulations for Authentication of Documents promulgated by the United States Department of State. In accordance with the Apostille Section of the Hague Convention, for U.S. issued documents to be valid in South Korea , they must bear an Apostille with the seal or stamp of The US state where the document was issued. Documents bearing an Apostille do not require any further legalization.